I met Greg and his wife, Christine when I first opened my Purple Pear location here on Glisan Street. These are very talented people who have immense creativity. Christine makes beautiful historically accurate dolls and Greg is not only a writer but someone who loves to paint and age furniture. 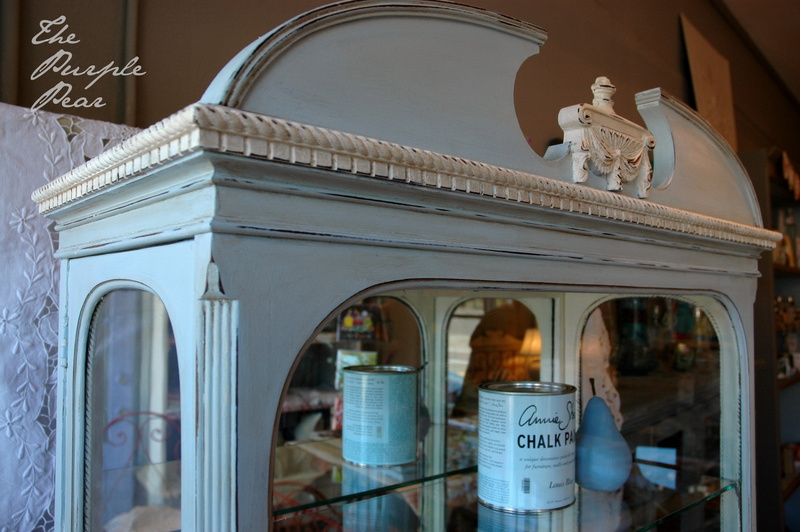 Greg was drawn to my store because of the Chalk Paint® by Annie Sloan. He experiments with lots of colors, and I had already sold one of his beautiful pieces some time ago. Recently Greg told be about another piece he had painted and brought it in to show me. Greg was attracted to the cabinet because of its classic lines, its two-door front opening and its ample trim and embellishments. At one time it had been used to house a DVD player with a television set sitting on the top. It had also been painted bright green and later been given a “shabby” overcoat of white latex paint. Greg was clearly inspired one morning when he woke up and decided to use the color combination Antoinette and Arles. Greg began painting it in rough splotches because he was trying to find the correct balance of the two colors. 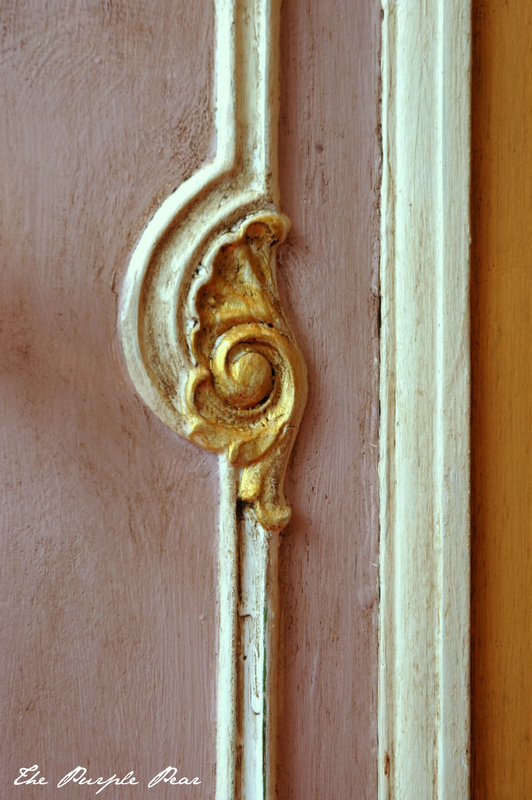 He then repainted the fine trim with Annie’s Old White because he wanted to finish the piece with the wax and knew that the Chalk Paint® was a better paint with the wax than the latex. He also felt the Old White was a much better shade of white than was the original latex white. 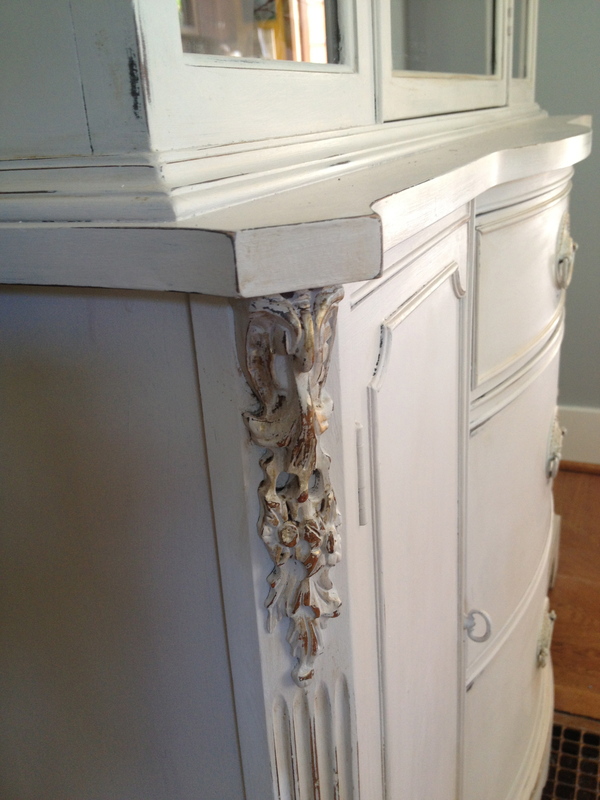 A signature of Greg’s style is to rework this type of furniture in order to intensely age it. He wants his pieces to look like they have been sitting in a drafty French chateau for about two hundred years. He feels this can best be achieved with the use of Annie’s special soft waxes. 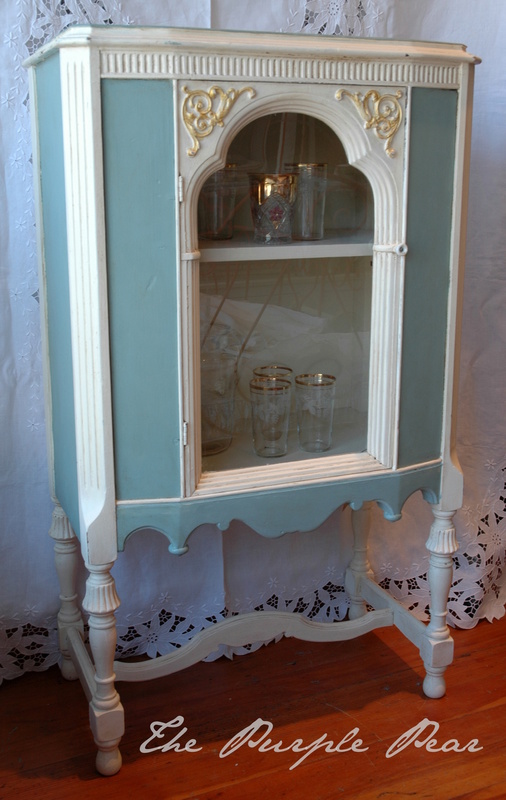 After the base coat of the paint was dry, Greg covered the piece with a layer of Annie Sloan Clear Wax. Next, he applied Annie Sloan Dark Wax over much of the piece with heavier layers where the aging would be most prominenet – around the legs and the lower areas of the cabinet, as well as in the corners and crevices where grunge normally accumulates. Immediately Greg went over the dark wax with more of the clear wax. He considers this the most important step in the aging. He applies enough of the clear wax to saturate the dark wax and then uses a clean cloth to remove and manipulate dark wax to achieve the aged appearance. 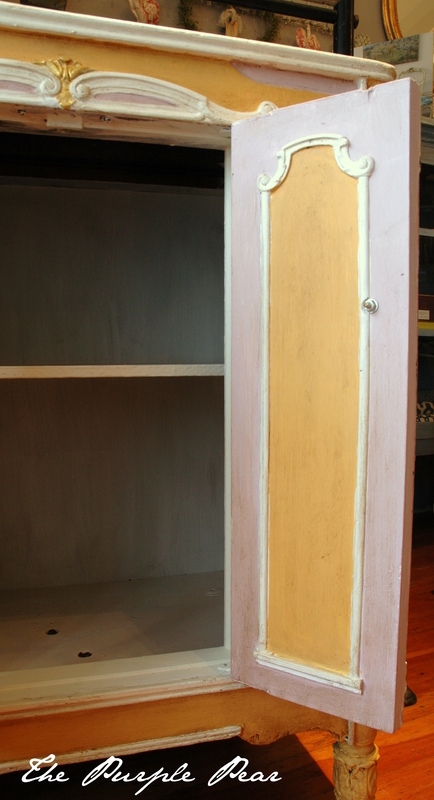 Greg also used Artisan Enhancements Crackle Tex® to further distress the top of the cabinet. He did this by applying a base coat of Old White, then a coat of Crackle Tex, and then another coat of Old White – letting each coat dry in between – and then using the wax technique so the dark wax would highlight the surface cracks. This piece can be seen at my store, The Purple Pear. Come take a look at Greg’s great piece and see if you would like to buy this and place it in a special spot in your home! In addition to the Introduction to Chalk Paint® workshops, I am now offering another class at The Purple Pear in which I am calling “The Second Act.” This will be a fun and inspirational time for those who are ready to broaden their painting skill set! Five techniques are covered in this class, and they are listed and described below. It is helpful if you have had a class previously that has introduced you to the basics of the paint and wax, but this is a fun and easy class, so please do not be intimidated by these new techniques. 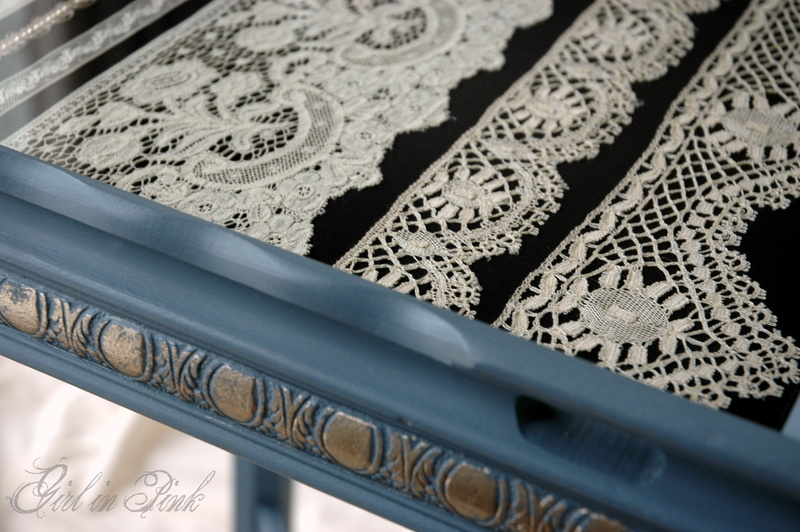 With this technique, we will use traditional Swedish colors of Chalk Paint®: French Linen, Old White, and Paris Grey. Applying wax to a painted wet surface achieves beautiful effects and subtle tonal highlights. 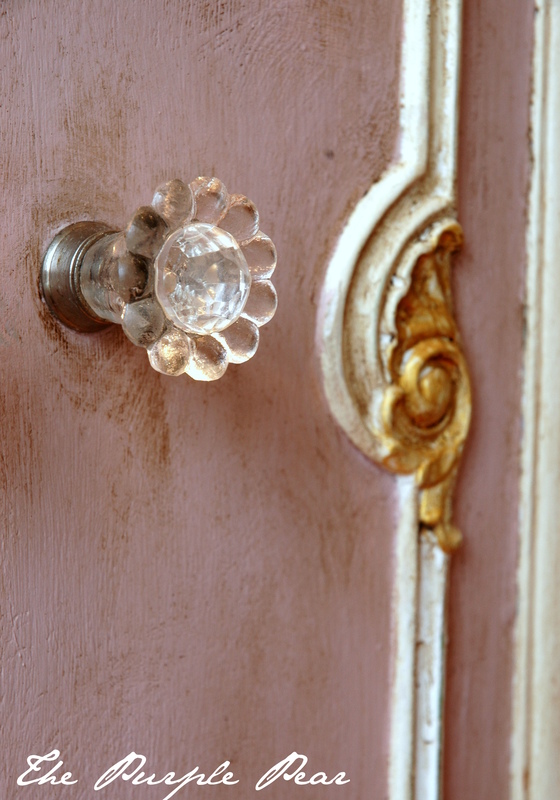 This famous 18th c. style is well known for its asymmetrical designs, pastel-like colors, cabriole legs, curvy shapes, and gold. 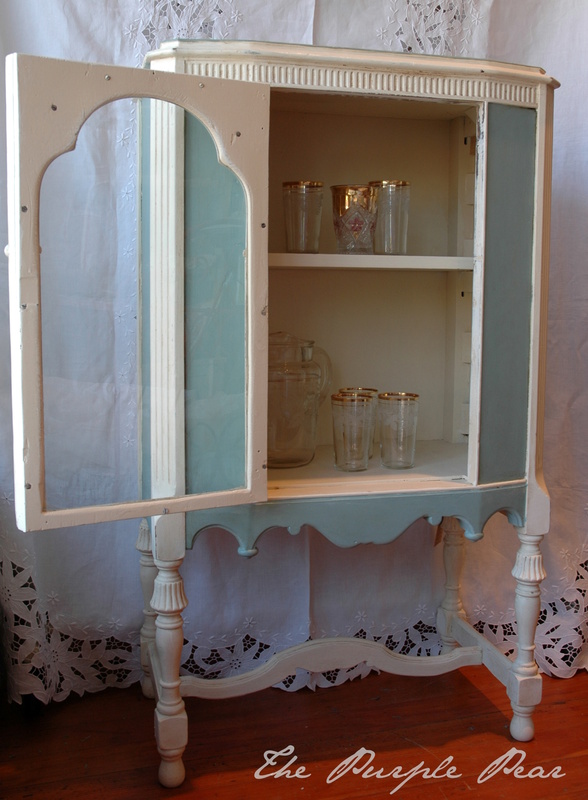 Chalk Paint® colors that suit this style are Aubusson Blue, Louis Blue, Duck Egg, and Antoinette. In this technique we will layer some colors, use leaf size, and apply gilding using imitation gold leaf. 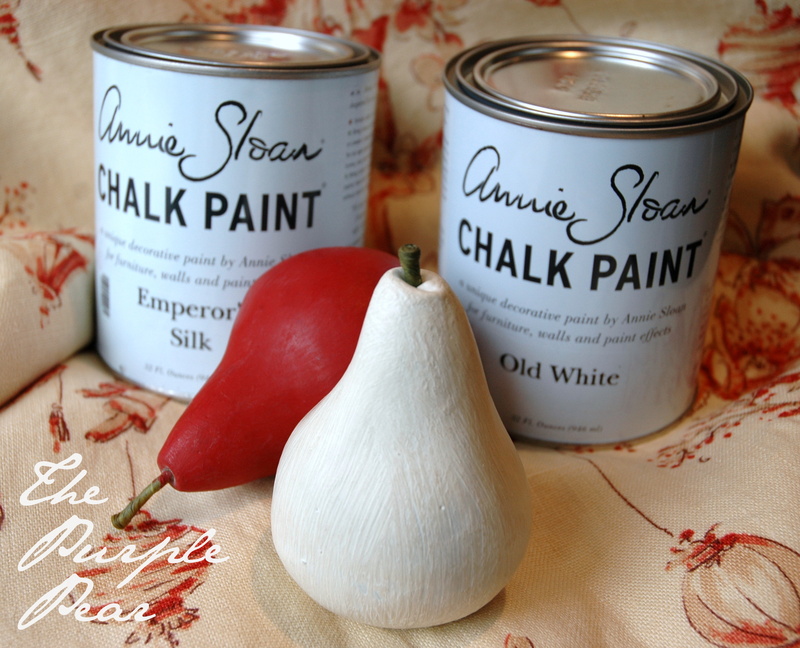 The palette of Chalk Paint® colors created by Annie Sloan is both diverse and easily mixed, but the whites allow one to create an amazing tonal range for each color. We will compare the Old White, Pure White, and mix Classic White and see how each of these compares and changes with both clear and dark wax. 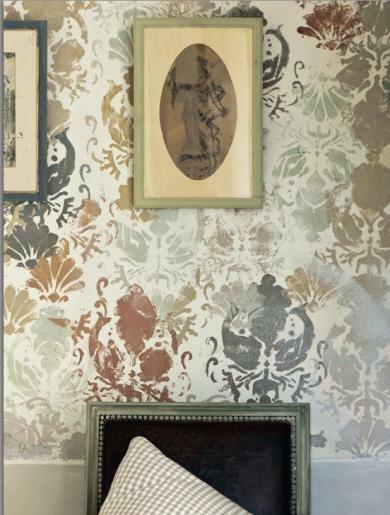 Annie Sloan’s favorite way to use a stencil is to make a random all-over pattern that resembles damask or antique fabric. This stencil technique is inspired by simple stencil designs that were used on walls of American farmhouses lived in by early Swedish settlers who decorated their homes using this traditional painting style and technique. In this technique we will choose a palette inspired by French-inspired interiors. 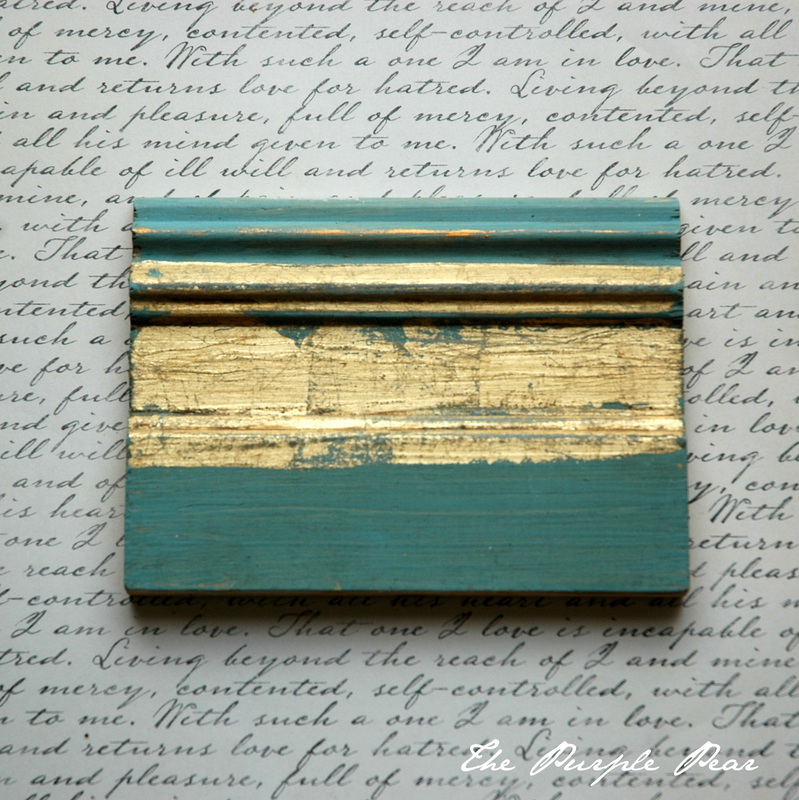 Using the method of wax resist, we will layer paint and wax to create a subtle and distressed look. Please visit The Purple Pear Website’s Workshop page here for the dates and details about upcoming workshops. Reservations for the class can be made by calling The Purple Pear at 503.206.6554. 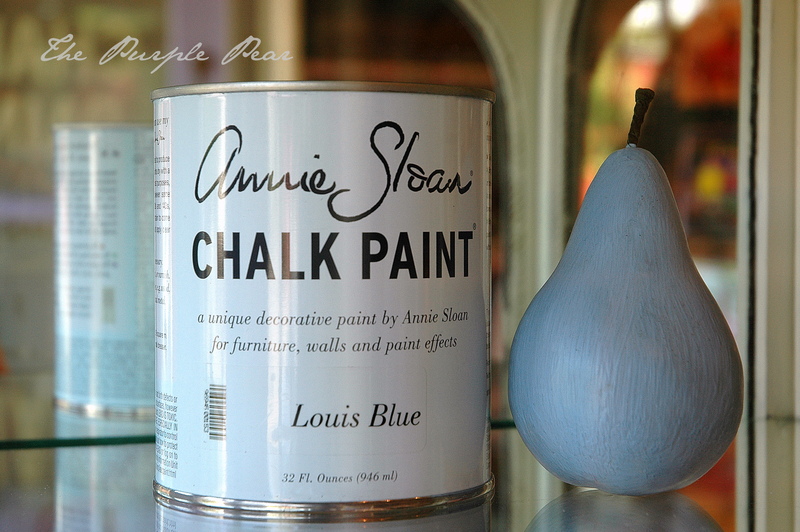 When Annie Sloan created her 30 Chalk Paint® colors, they were not chosen based on current trends or the basic color wheel. 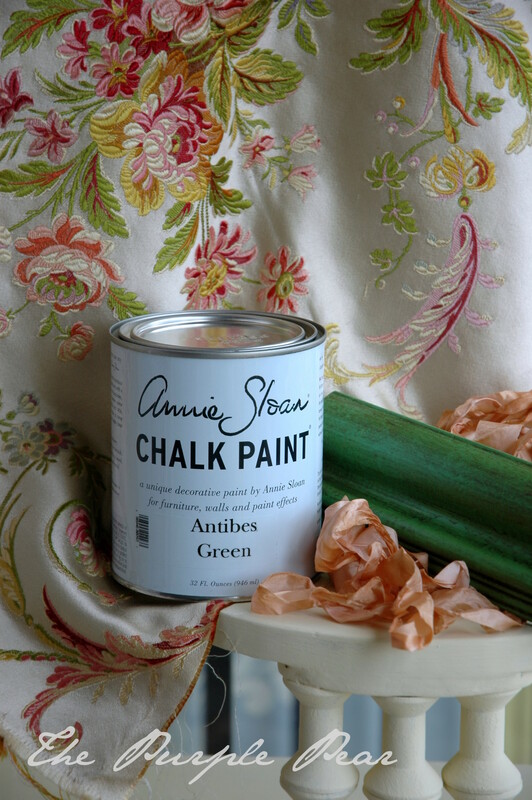 Annie’s colors were inspired by Europe’s lush history. 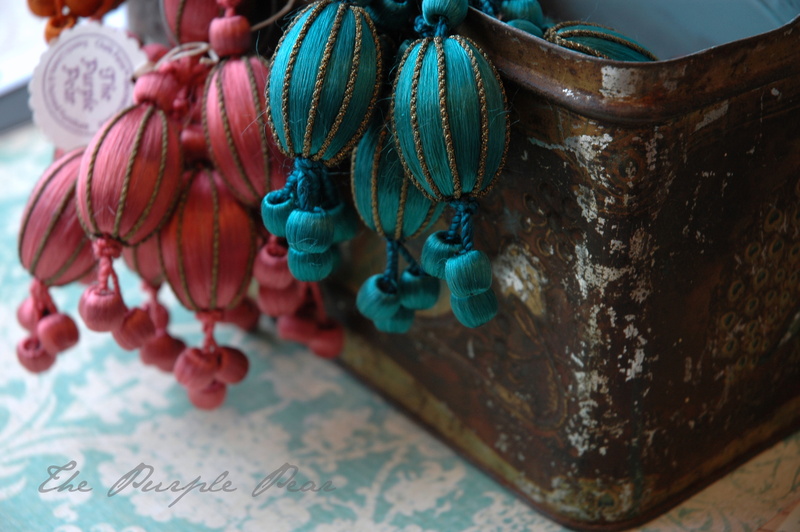 Timeless, rich colors that tell a story and evoke a feeling. This becomes evident to me almost daily as I work with Chalk Paint® while surrounded by the delicate old fabrics and other antiquities in my shop. Although the Chalk Paint® colors could not be easier to custom mix, one finds it isn’t necessary when coordinating with antiques. 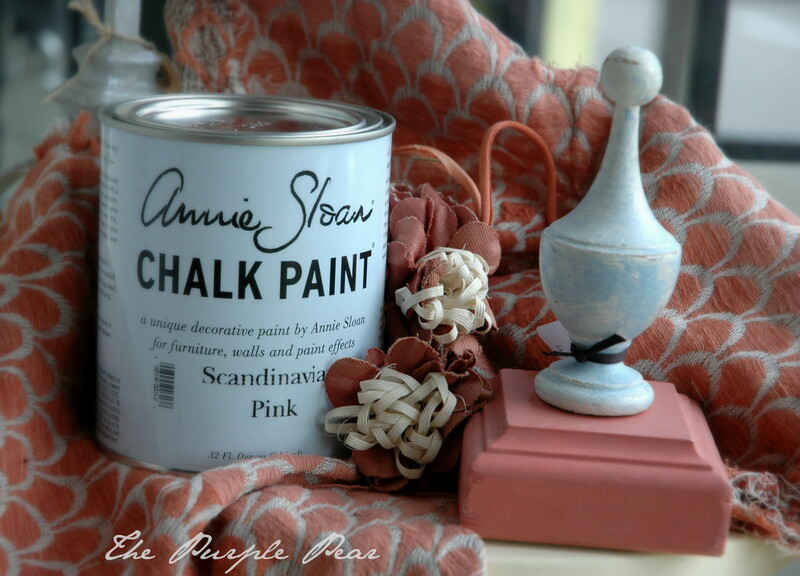 Thank you, Annie Sloan for your carefully selected colors. 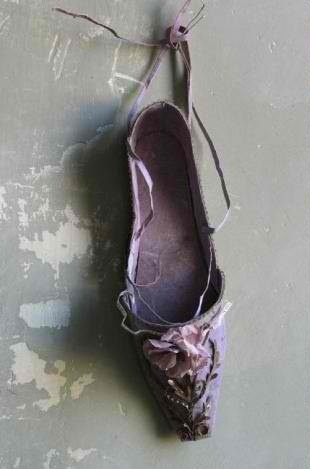 They are exquisite in everyway and appreciated so much by those of us who truly treasure the past! Drawn to it’s feminine lines, regal details, delicacy and grace, when first I took notice of this elegant piece of furniture at a local estate sale, I knew I couldn’t possibly leave the sale without it. 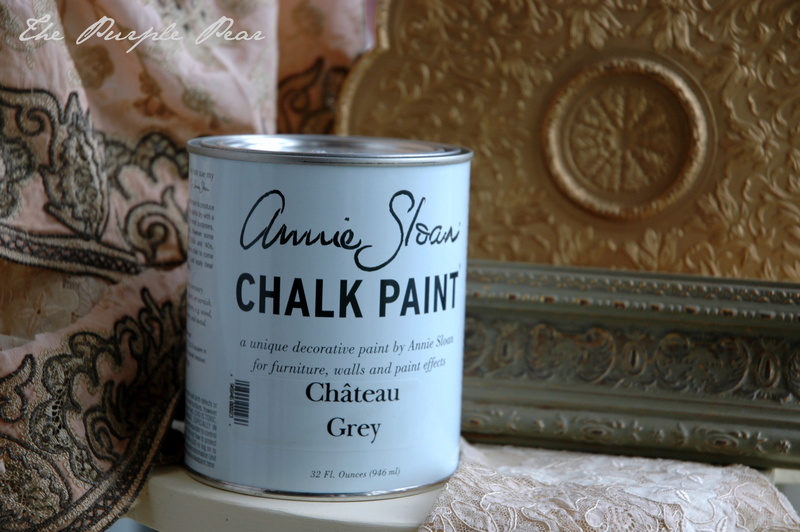 Beautiful as it was, Chalk Paint® Decorative Paint by Annie Sloan would elevate it’s character and charm to a whole new level, of that I was most certain! For several weeks, this little beauty graced us with her presence here at The Purple Pear while I awaited the inspiration and the spare time to start her transformation. A makeover on a piece such as this must not be rushed. 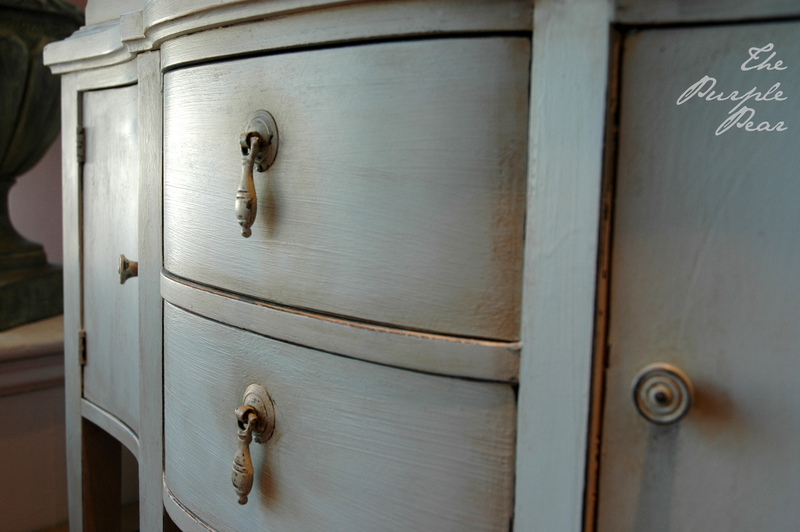 As Annie Sloan says, the furniture will speak to you and tell you the color it is destined to be! Before long it was undoubtedly decided. 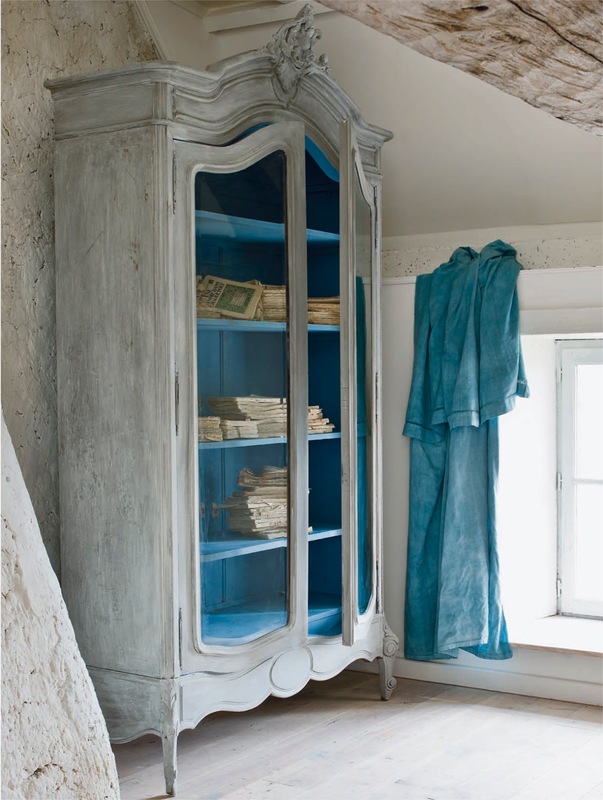 Louis Blue, which seems to exemplify an honorary seat in the history of fine furniture would be made slightly more subtle and feminine with the addition of Old White. 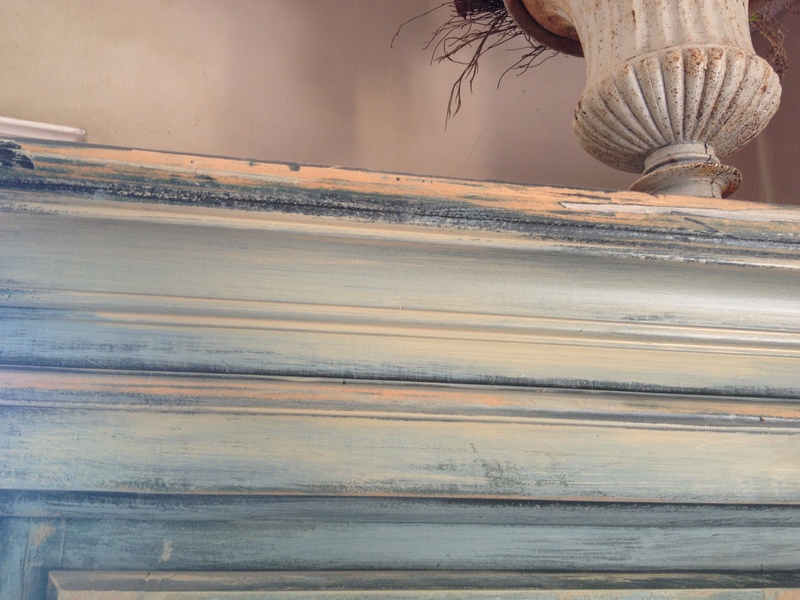 To give you an idea of the ratio for this custom color, I started by mixing 3/4 cup of Old White to 1/2 cup of Louis Blue. After two coats of this most lovely soft blue, I chose to highlight the accents in Old White, as well as the drawer and cupboard interiors. After a coat of clear wax and a bit of light distressing, I applied Annie Sloan’s dark wax to give the painted finish a time-worn, old world patina. So few pieces one finds today have this kind of delicacy and beauty. This one was absolutely an honor to refinish and refine. 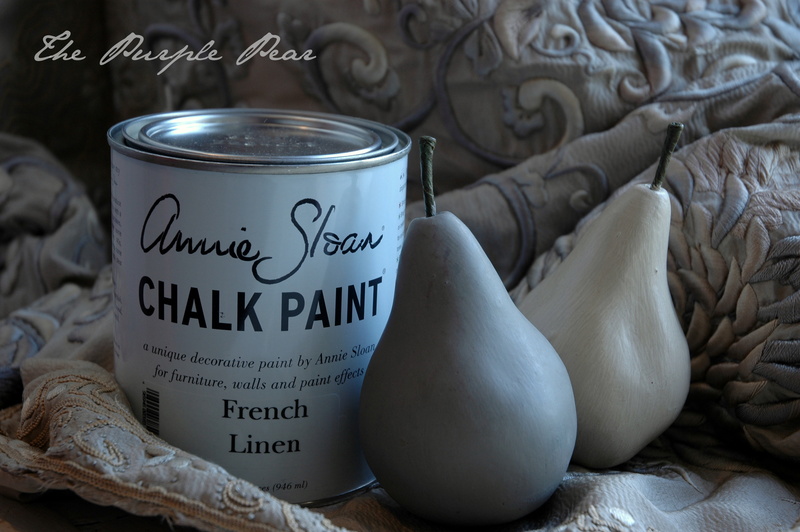 I have asked Gregory LeFever, a friend and favorite customer of The Purple Pear to share the details of his most recent Chalk Paint® Decorative Paint by Annie Sloan makeover project with us. Greg is a very gifted writer and editor and also loves to work with his hands to create beautiful pieces with Chalk Paint®, so he couldn’t be better suited to write this guest post for us! Greg shares his talents on his blog, Le Finials and has just opened a new Etsy shop where he is selling his exquisite hand crafted finials! We have been fortunate enough to have a few of these unique pieces at The Purple Pear. Greg has a gift for choosing the most inspiring color combinations and with great attention to detail, he ages these pieces to historic perfection. Now, I will let Greg share in his words the details of his latest furniture makeover project, this delightful little radio cabinet. Thank you, Greg! 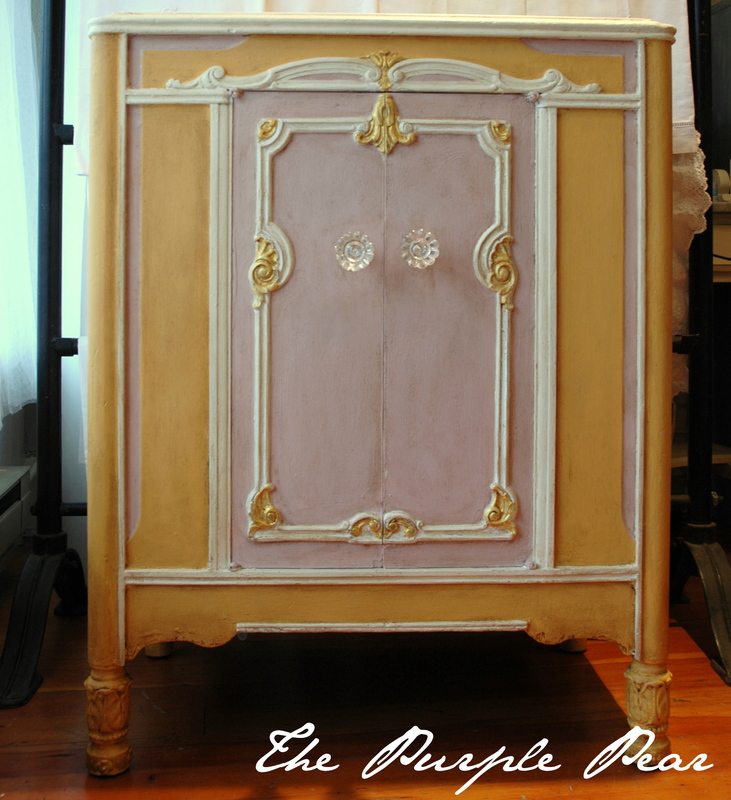 I found the old radio cabinet in a local antiques mall and was immediately attracted to its French lines, with cabriole legs and trim pieces. 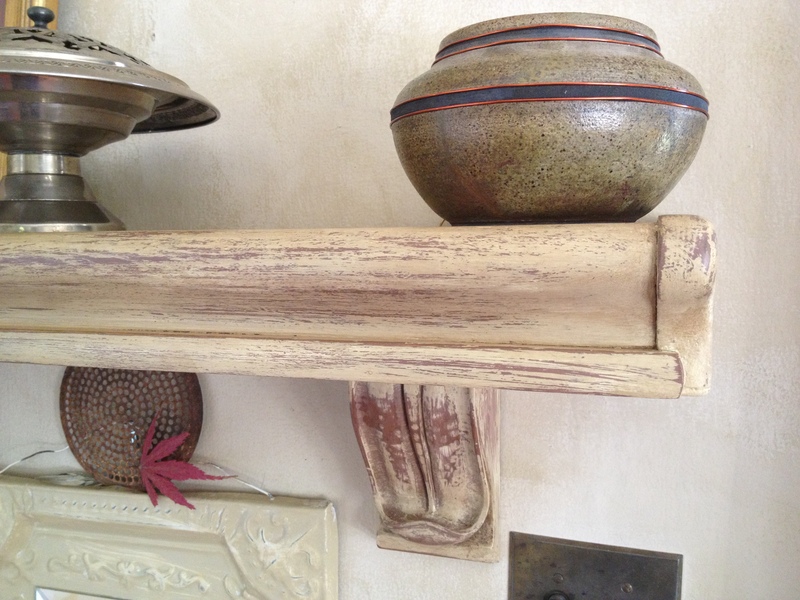 Someone had already “countrified” it by painting it stark white and sanding the edges. The little cabinet just shouted potential. 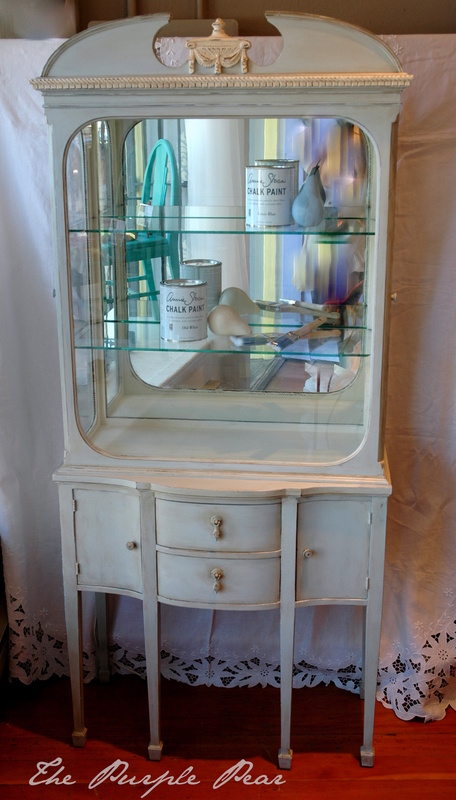 Using Annie Sloan Old White, I repainted the entire piece with chalk paint, toning down the original white to an eggshell shade. 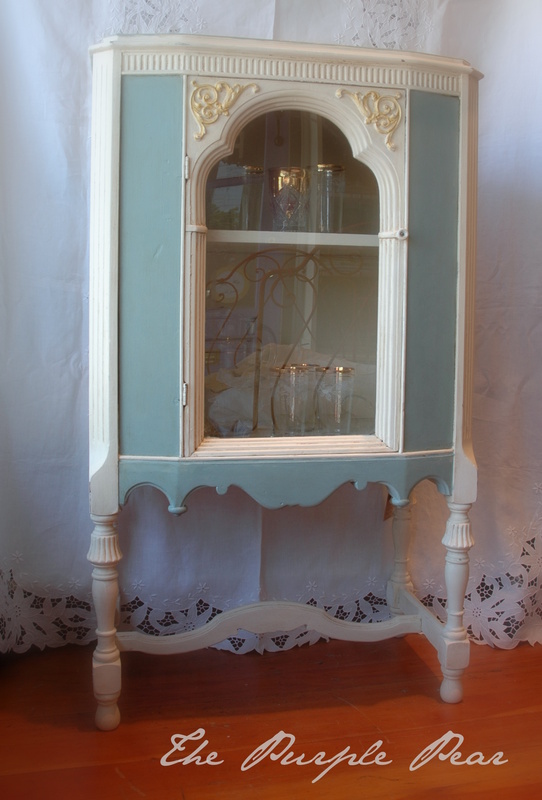 Then I selected the panels for painting with Annie Sloan Duck Egg Blue, which is a color of chalk paint Phyllis at The Purple Pear had steered me toward. 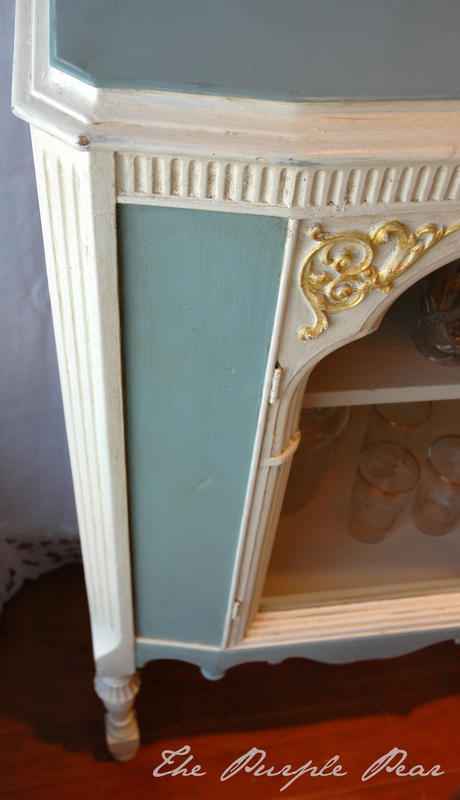 In my only departure from Annie Sloan paints, I lightly painted the two trim embellishments with regular gold acrylic paint I had in the workshop. The result of the Old White and Duck Egg Blue was a great improvement over the original white. Next came the trickiest step, but also the one with the greatest potential reward – the waxing. 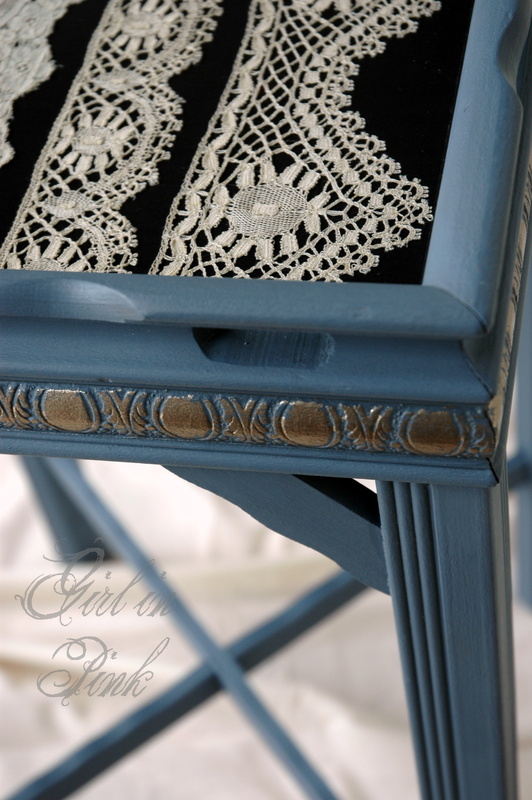 First I rubbed on a layer of Annie Sloan Clear Wax, working it well into the chalk paint and creating a richer tone of both the white and blue. 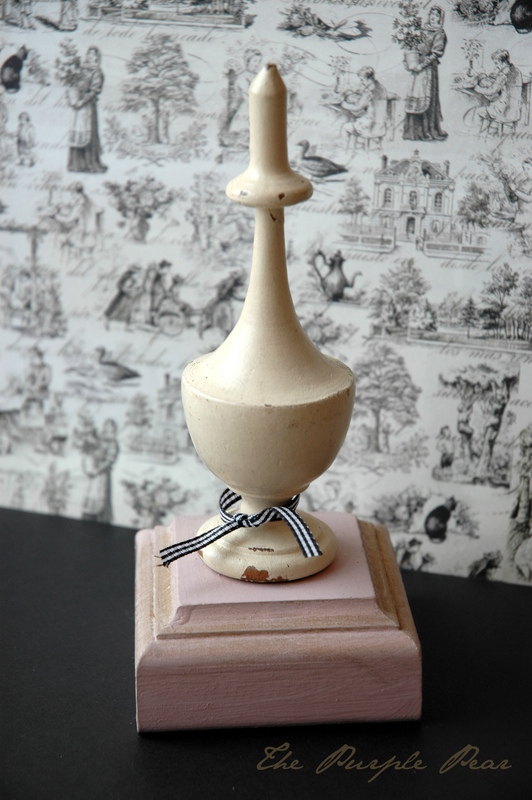 Then – very, very delicately – I rubbed on some Annie Sloan Dark Wax, wiping most of it off immediately after applying it. I knew I wanted the cabinet to have an aged effect, but I wanted it to be aged realistically. Applying the dark wax cautiously enabled me to achieve the effect I was seeking. In places where the dark wax seemed too heavy, I immediately rubbed it away by using a cloth with clear wax until I got the effect I wanted. Further distressing the piece with sandpaper and a small chisel also required caution and delicacy. For years I’ve studied how furniture actually ages, so I removed small amounts of paint only in those spots that realistically would receive high amounts of contact. 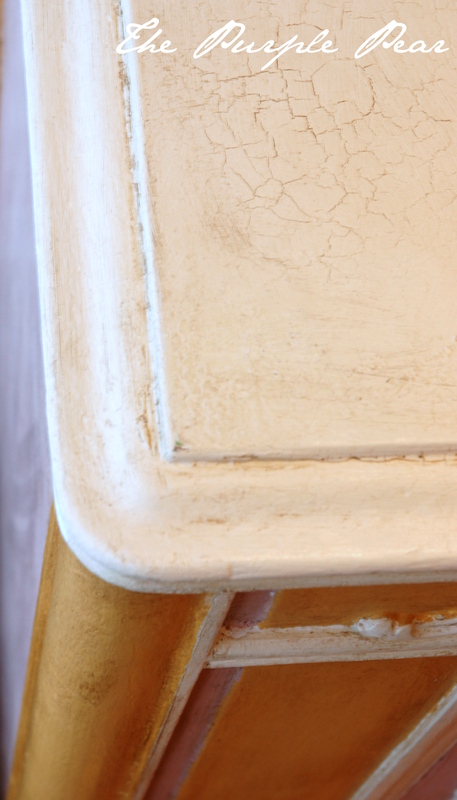 Aging a piece like this one is definitely a case of “less is more.” A tiny bit of paint chipped away or rubbed with sandpaper goes a long way toward adding visual age to furniture. Phyllis at The Purple Pear has been a real inspiration in my furniture art. 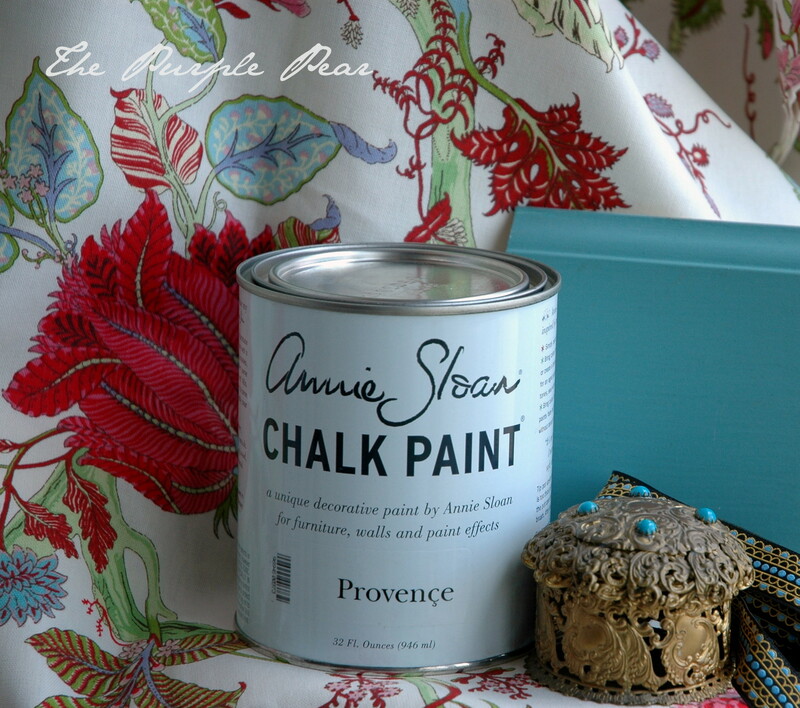 She initially steered me toward the Annie Sloan chalk paints and waxes, and showed me Annie’s wonderful books on technique. 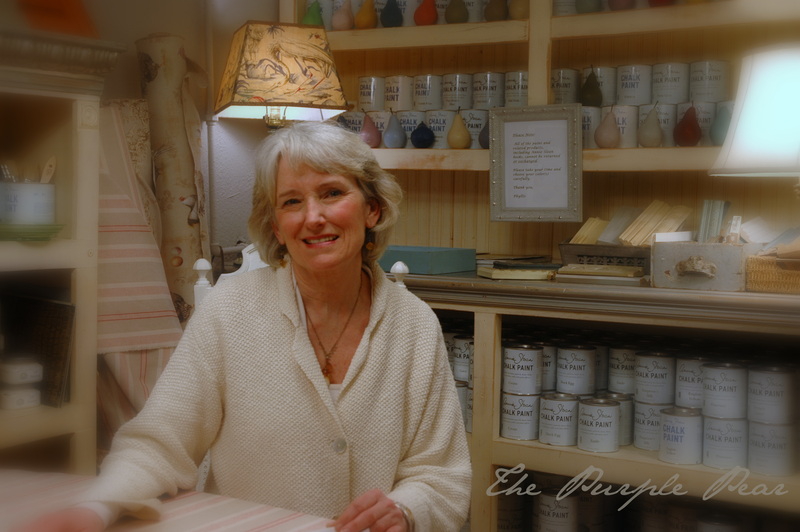 Phyllis herself is a master of using the chalk paints and waxes, and the furniture she’s refurbished has tremendous appeal. Many thanks to Greg for taking the time to share his beautiful Radio Cabient Project with us! Please take a moment to visit Greg’s Etsy Shop to see more of his wonderful creations! Hello! Amanda here, of Girl in Pink. 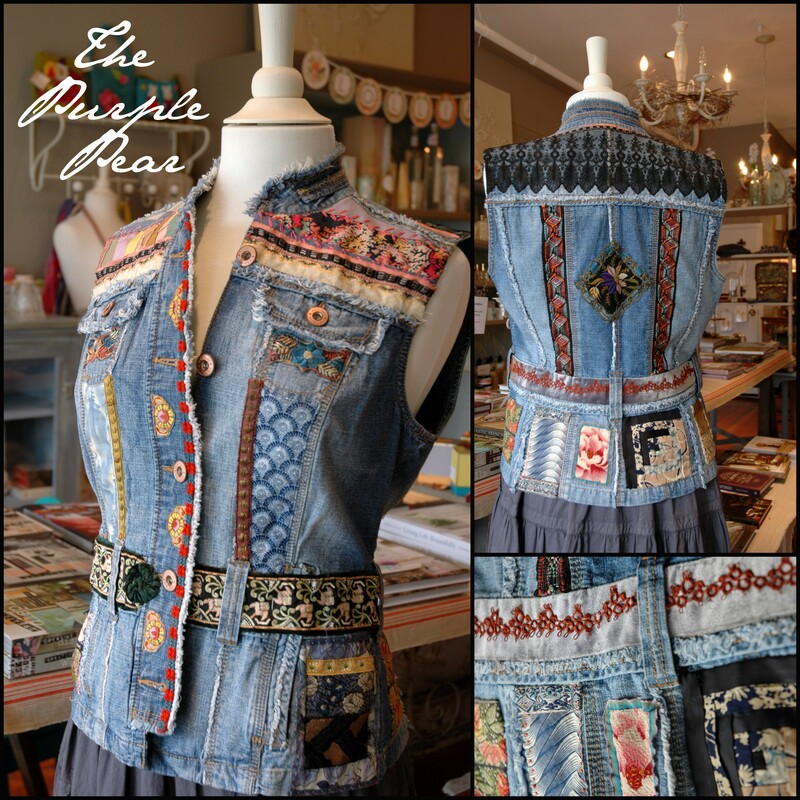 Phyllis is a dear friend of mine and I find myself constantly drawn to her gorgeous French inspired boutique, The Purple Pear! During my visits, I always seem to discover one or two unique treasures that resonate with me and eventually give rise to a new project idea! It recently occurred to me that I might do a guest post now and then for the Purple Pear, to share how my purchases there have stemmed one creative endeavor or another. Phyllis sweetly obliged, and so here we are! Thank you, Phyllis! A little brown Art Deco style table, purchased at a local thrift store needed some tender loving care. I was rather excited about the glass top, thinking about how much fun I could have finding treasures to display beneath the glass! 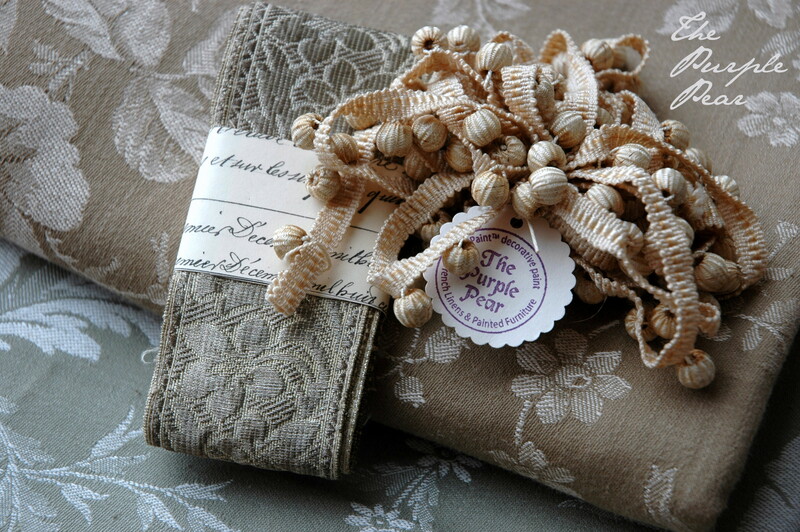 It was a visit to the Purple Pear that inspired me to display a collection of antique laces and trims on the table top. You see, Phyllis offers an amazing selection of antique trims for sale. 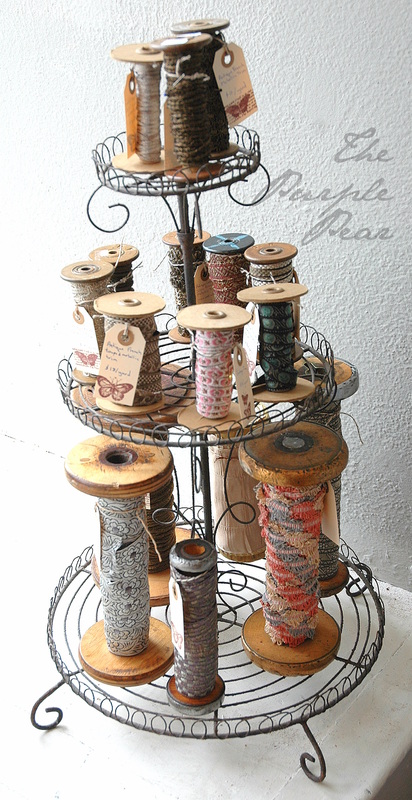 Most are from France, and they are all displayed very beautifully on old wooden spools thoughtfully arranged in creative vignettes. 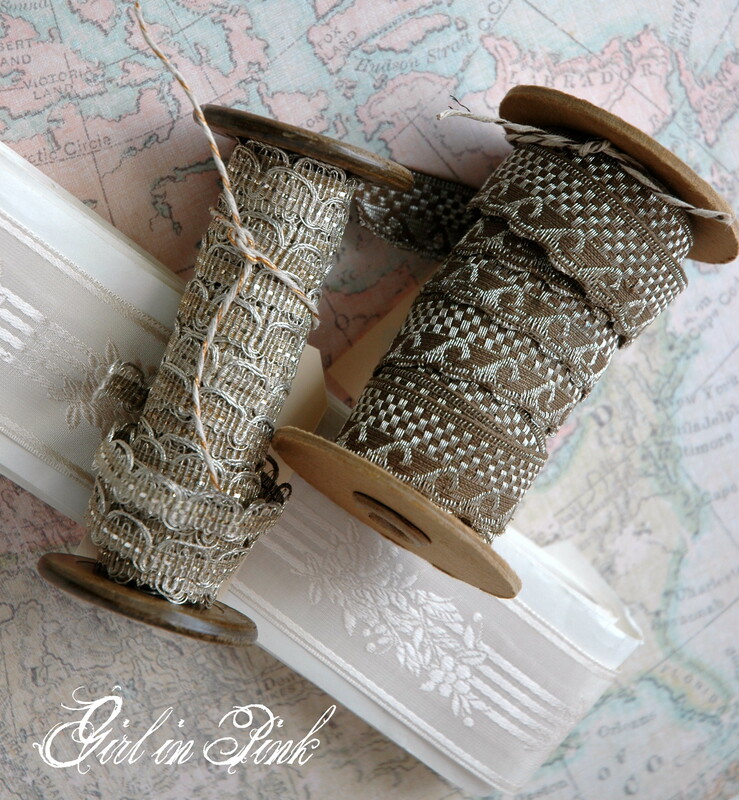 I selected a few that I thought would go nicely with some pieces of lace that I had in my collection at home. 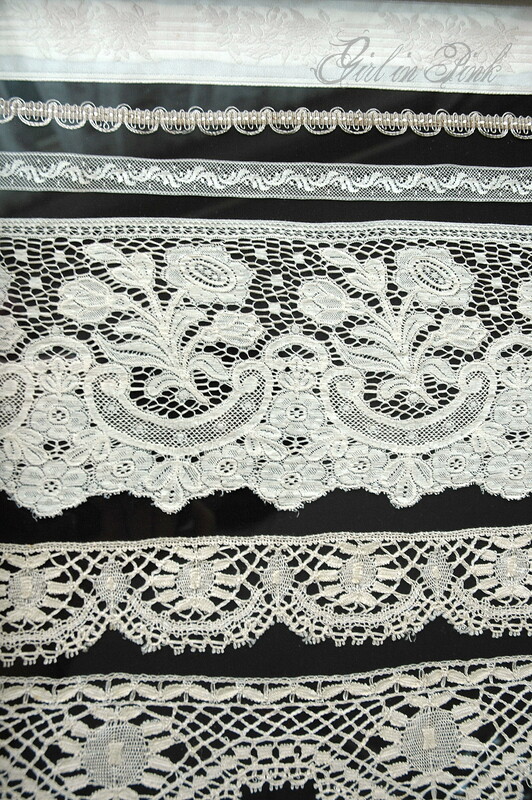 I purchased just a half yard of each of these exquisite antique French trims. However, when I paired them with my laces at home, I decided the brown trim didn’t quite work. It now sits amongst my treasures in my creative workspace, ready to inspire another project! 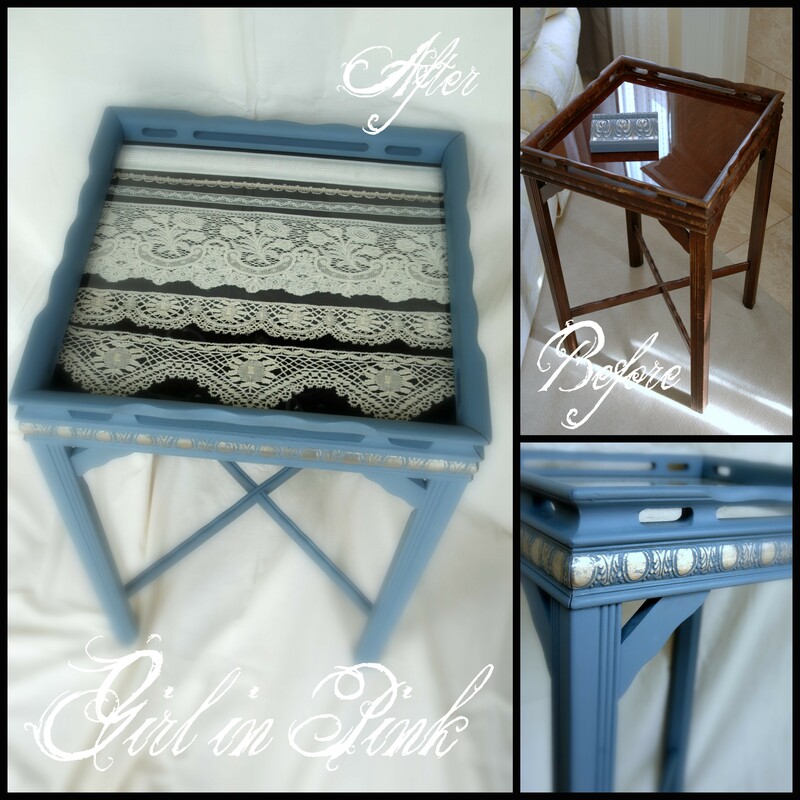 The table itself I painted in Old Violet Chalk Paint® Decorative Paint by Annie Sloan. I used Artisan Enhancements Foil Size to add a Pewter colored foil treatment accentuating the carved details along the table top. All of these products are also available at the Purple Pear! In America, the word Haberdashery refers to a shop selling menswear, however in England it is a shop that sells all sorts of ribbons, trims and buttons. All the while I was working on this little table makeover, I imagined it as a small display piece in an old Haberdashery shop where customers could view the selection of trims under glass and point to the one that they wished to purchase a length of for their sewing projects. 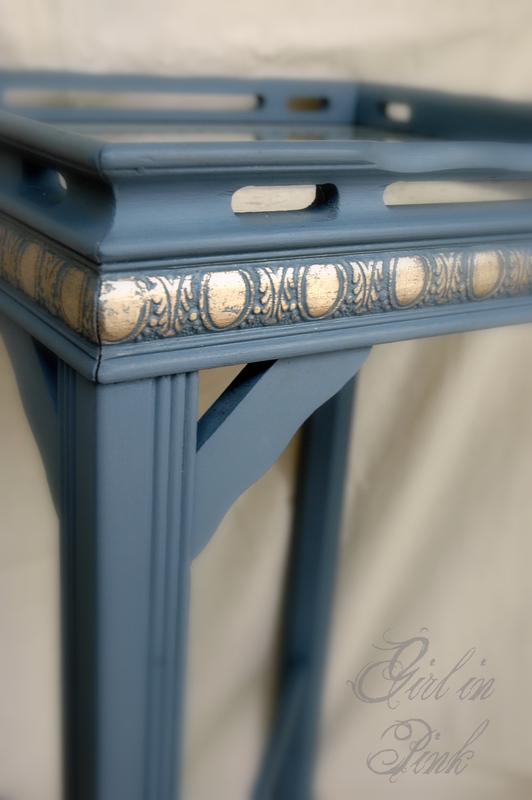 Fabricating a history for a furniture piece during the makeover is often part of the creative process for me. It usually points me towards a name for the piece as well! 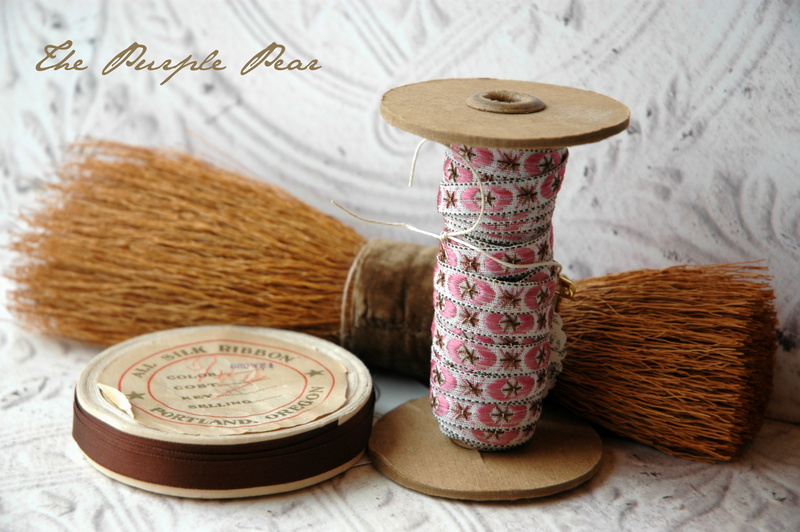 The Purple Pear in many ways reminds me of a Haberdashery shop, or Mercerie as they would call it in France. 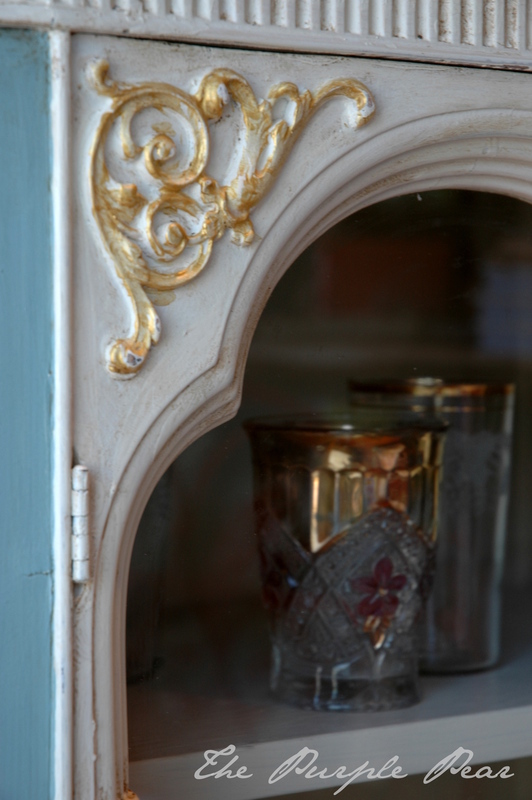 Not only does Phyllis carry a selection of gorgeous antique French trims, but also beautiful glass compotes filled with delicate old buttons, and stacks of amazing antique textiles. 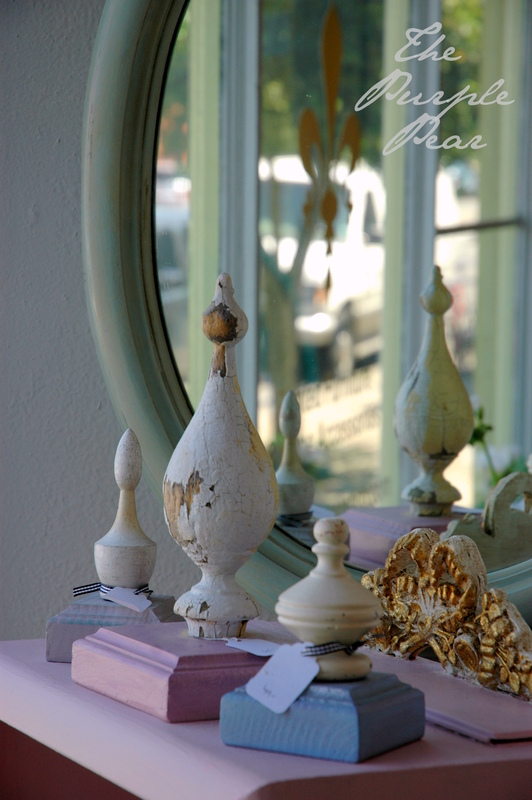 All this in addition to the lovely home décor books, Chalk Paint®, Artisan Enhancements products, Royal Design Stencils and Do it Yourself Chic furniture appliques makes The Purple Pear an ideal place to visit for creative inspiration! Thank you Phyllis, for encouraging and supporting the creativity of your customers with your thoughtfully displayed treasures and all of the necessary elements to create beautiful things! 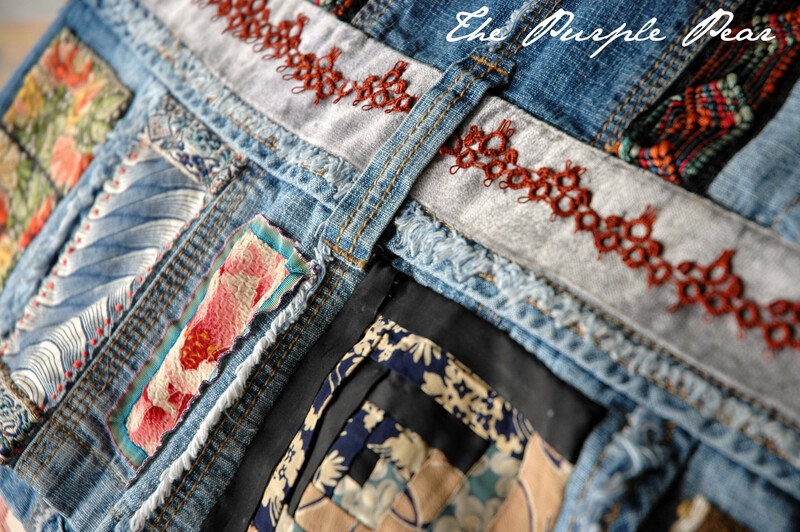 And, thank you for allowing me to share my latest Purple Pear inspired project here on your blog! 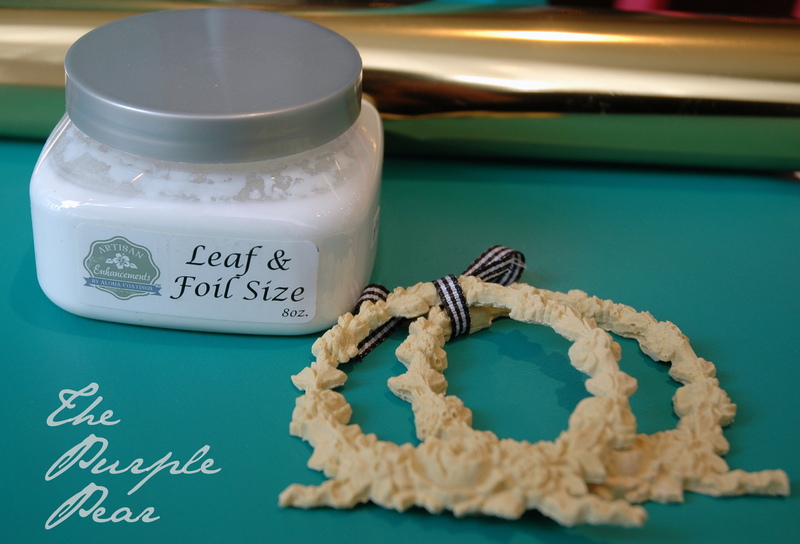 Lollia Gift Basket Giveaway at The Purple Pear! We are having an in-store giveaway here at The Purple Pear! To enter, just stop by anytime during our regular store hours between now and Saturday, May 24th! No purchase necessary. 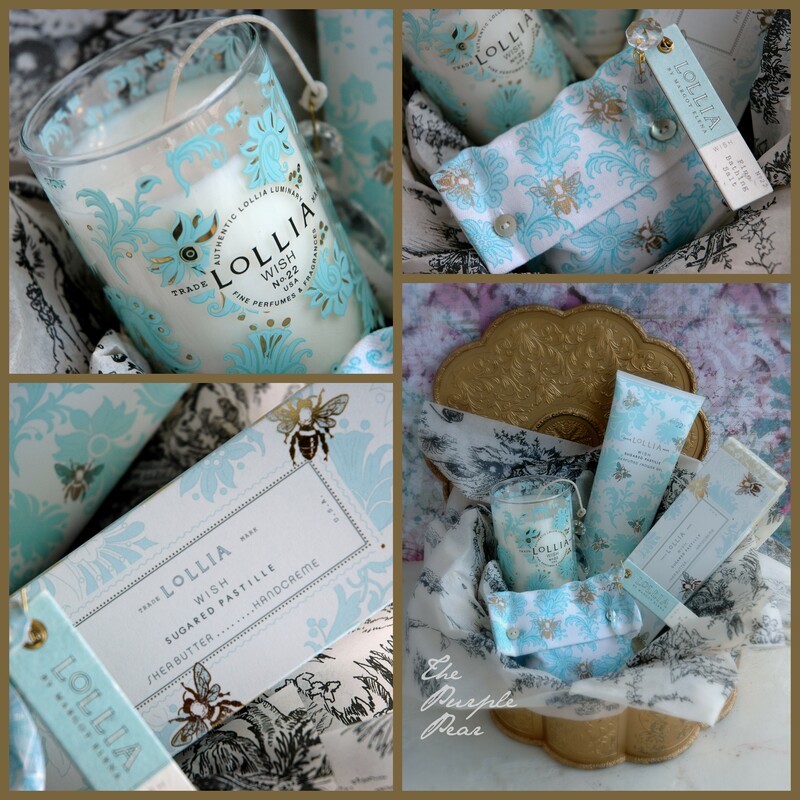 Included in the giveaway are four beautifully packaged, fragrant products from the Lollia Wish line. 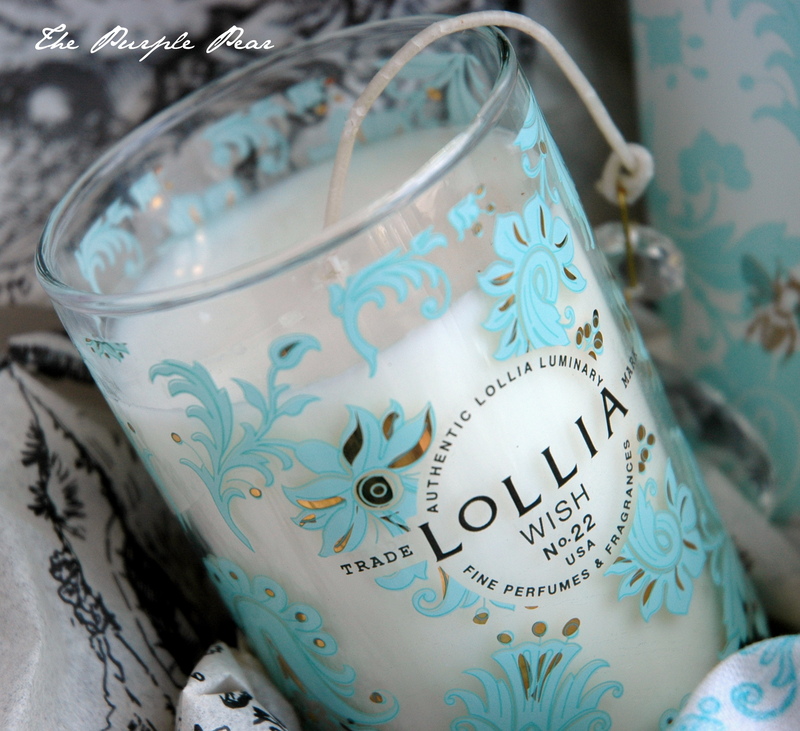 The Wish fragrance features a delightful bouquet of sugarcane, vanilla bean and jasmine. 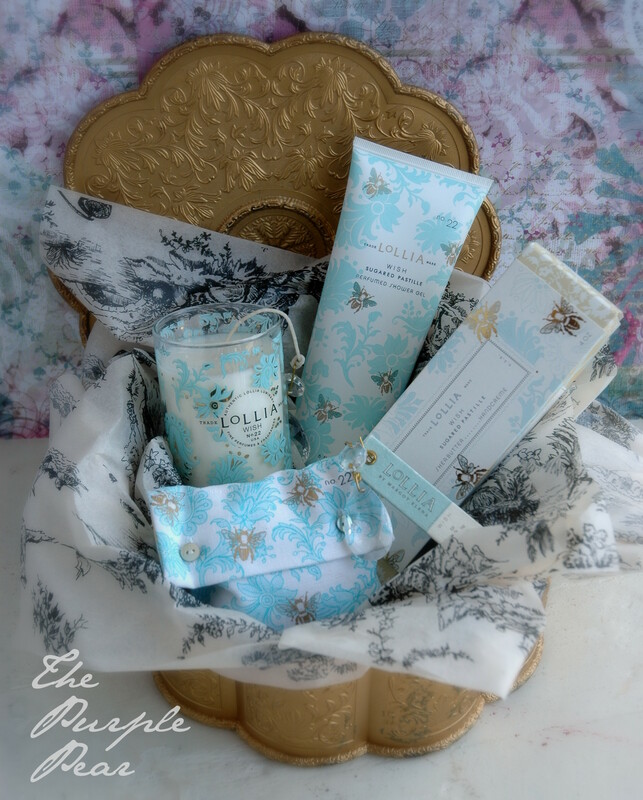 Included in this giveaway is a Lollia Wish candle, bath salts, shower gel and luxurious lotion in a lovely vintage gold box. The winner will be announced on Saturday, May 24th and may collect their prize here at the store at their earliest convenience. If you are local, please stop in and enter our drawing! If not, visit us on Facebook where we are having another giveaway especially for our Facebook friends! Happy spring to you! Thank you for your visit! 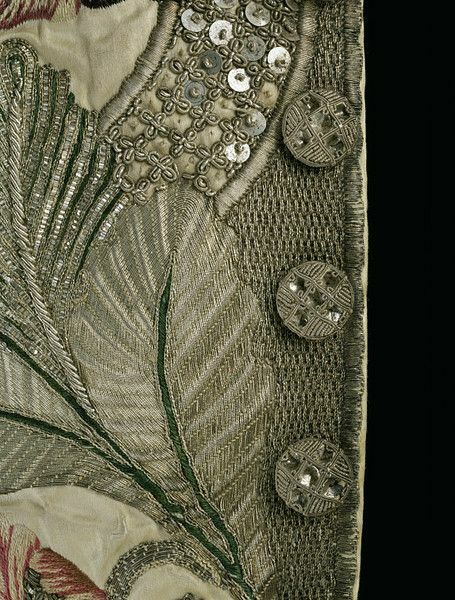 Antique Ribbons, trims, adornments, embellishments. 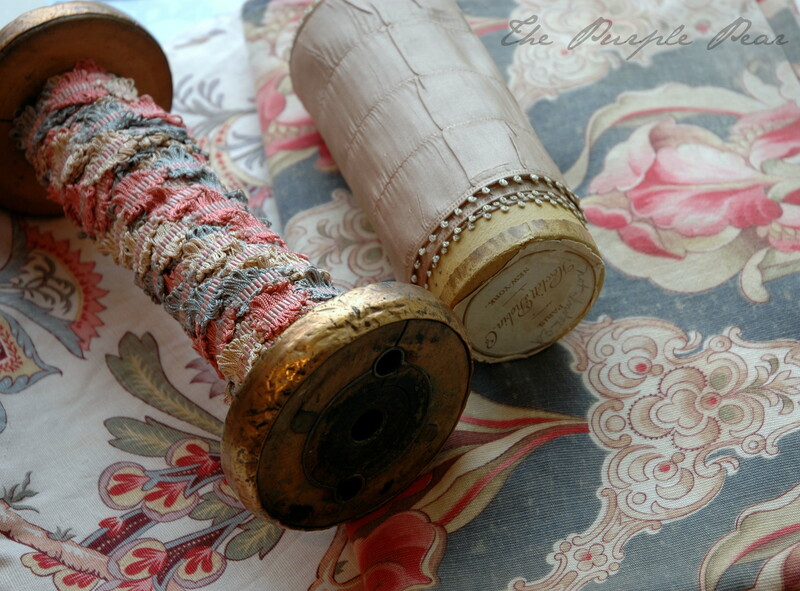 Bundles and bobbins and spools wound with lengths of color, pattern and texture. Timeless little treasures to gather, to savor and to inspire creativity. 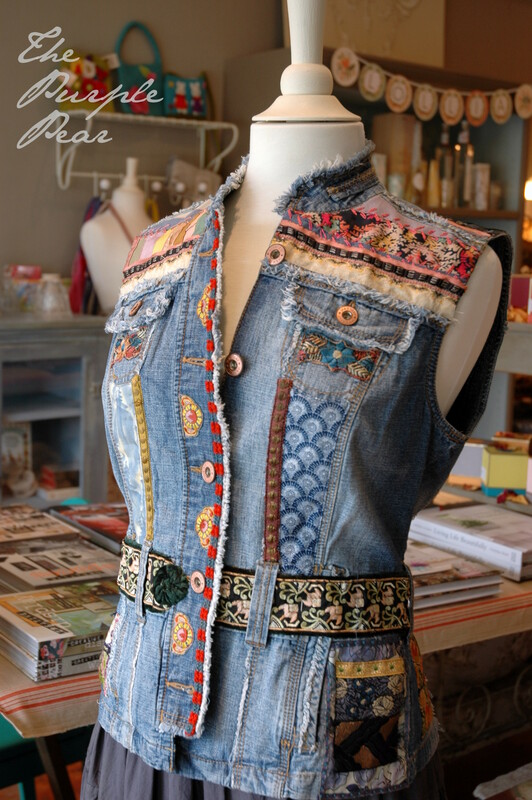 A couple of weeks ago I shared this denim vest, refashioned with vintage trims and textiles. If you would like to read more about it, you can find the blog post here. 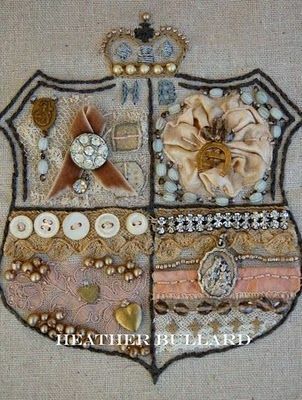 I recently finished another project using vintage trims, but in a very different style. 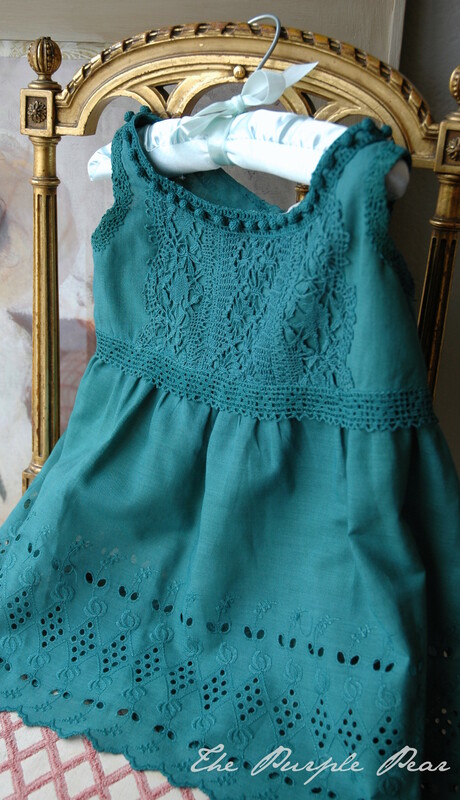 This sweet little baby dress started out simple and white. 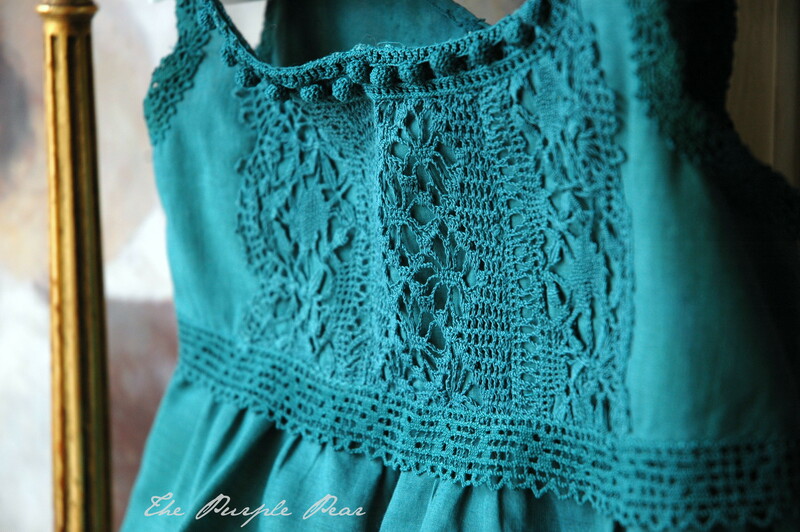 Using a washing machine fabric dye, I was able to achieve this beautiful and vibrant teal blue color. At the same time, I dyed a selection of vintage laces and trims to match. 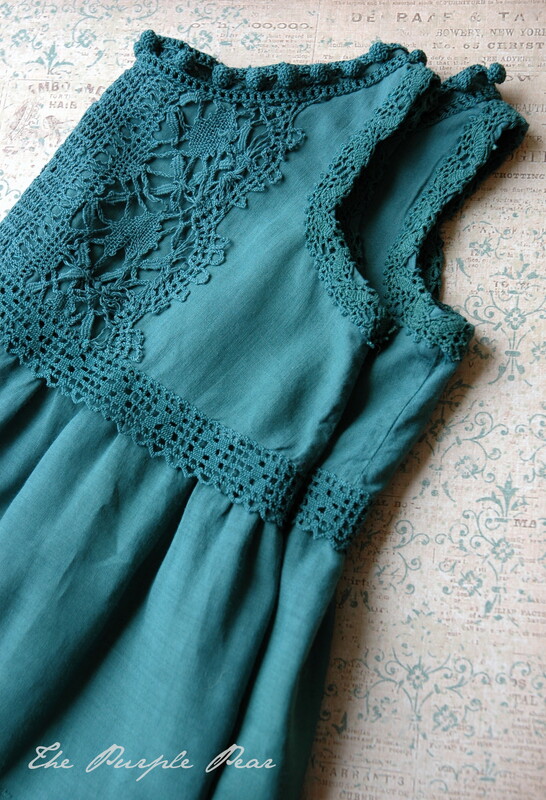 I sewed each piece of trim on by hand. 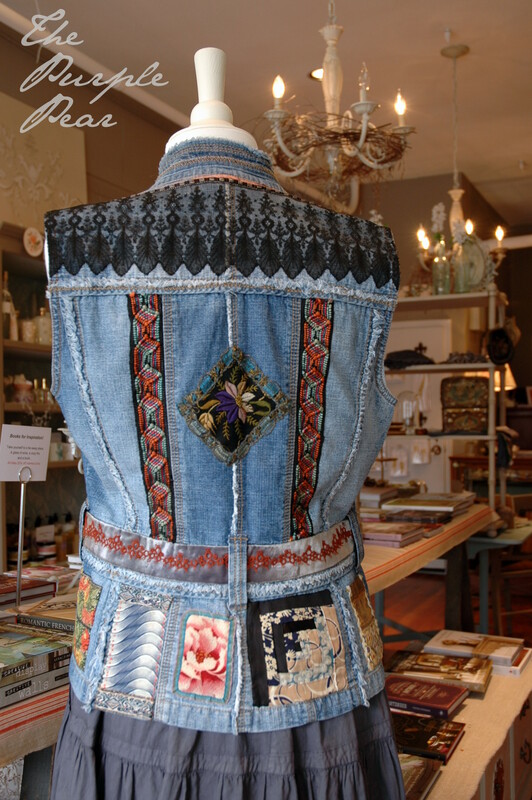 Another fashion re-fashion using antique embellishments! 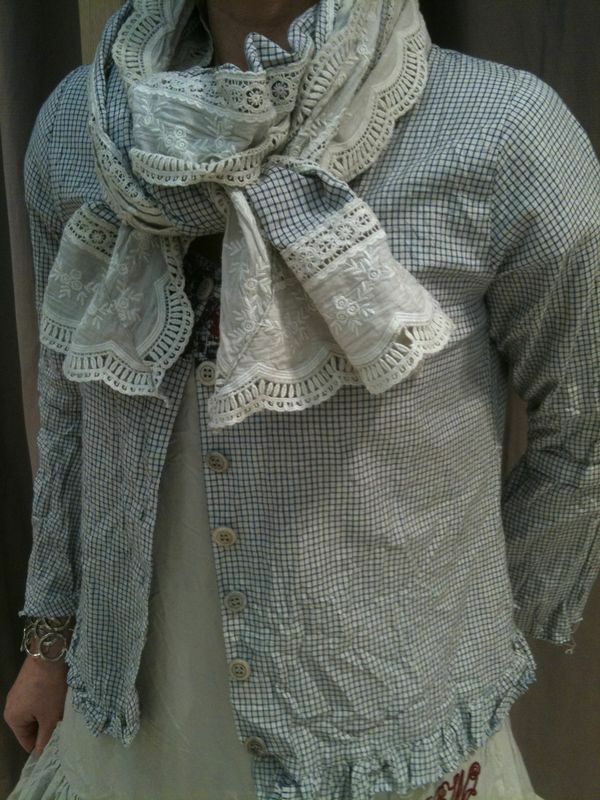 This is such a fun way to add uniqueness and charm to a garment! 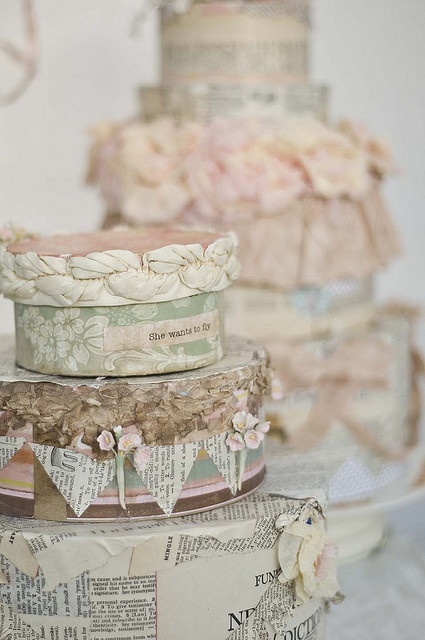 Many creative and talented individuals are using antique ribbons and trims in inspiring ways. Here are just a few from my Pinterest board where I have been collecting ideas! 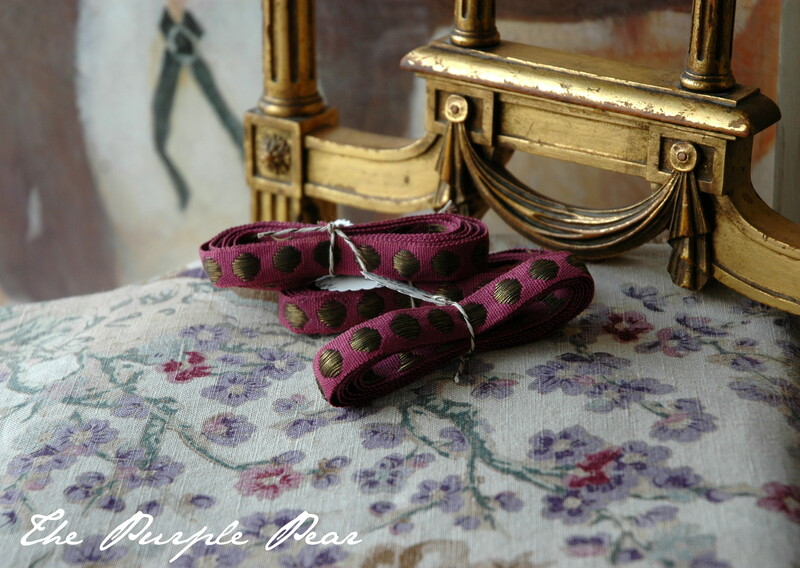 If you live in or near Portland, Oregon, I hope you will come by and visit the Purple Pear and explore our selection of antique textiles and trims. Please be sure to join me on Facebook for more information and inspiration from the Purple Pear! Thank you! Some time ago, I passed by a most beautiful piece of furniture in a marketing display. The color captivated me more than anything else. 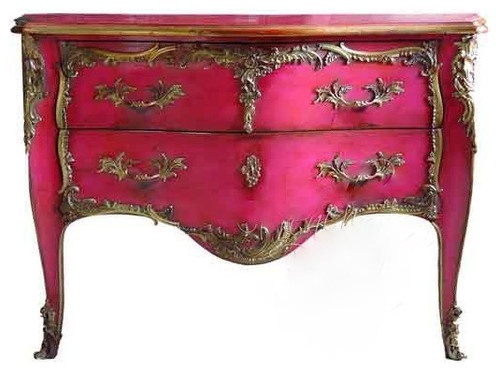 A rich, vibrant, majestic pink perfectly accented with gold hardware. It was very similar to this piece that I recently came across on Pinterest, here. 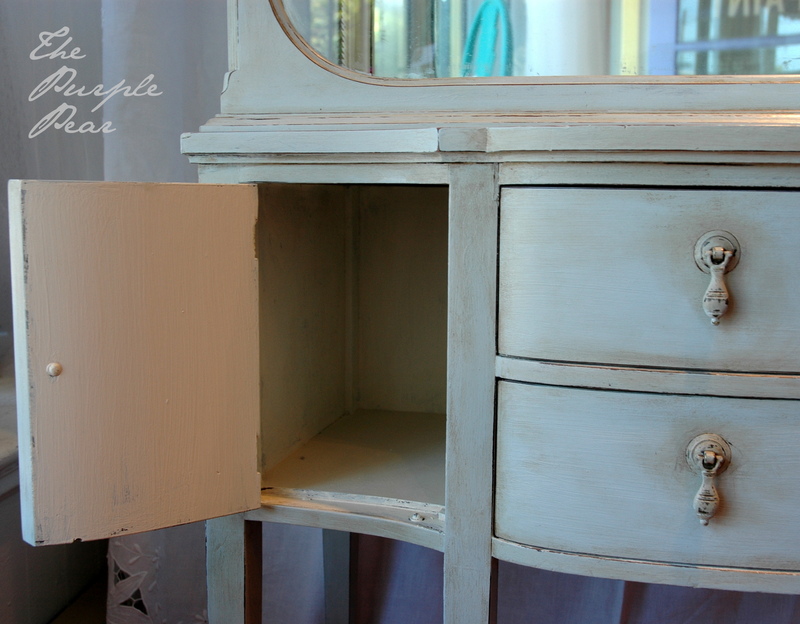 I knew I had to try to recreate the color using Chalk Paint®. Approximately 1 part Emperor’s Silk to 1 part Old White produced this wonderful, rich pink color I was hoping for. 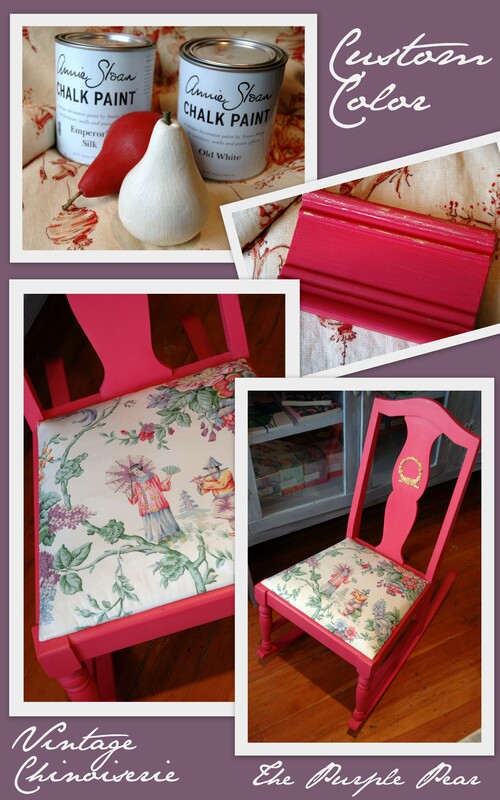 A sweet little 1930’s bedroom rocker seemed the ideal candidate for my custom pink mix. After giving the chair a couple of coats of paint and allowing it to dry, I finished it off with Annie Sloan’s soft Clear Wax. Then, it was time for a little embellishing! 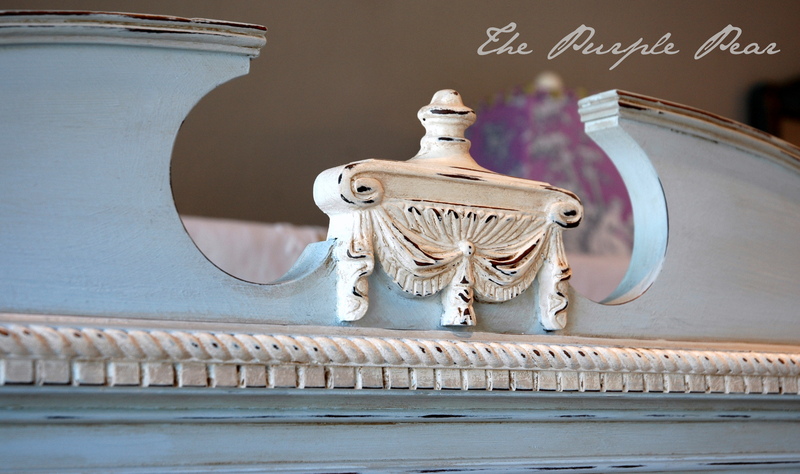 I carry a wonderful line of furniture appliques in my shop that are so fun for adding a bit more character to a makeover project. The little wreath was just what was needed for the chair back. I applied a gold leaf to it using Artisan Enhancement’s Leaf and Foil Size medium. 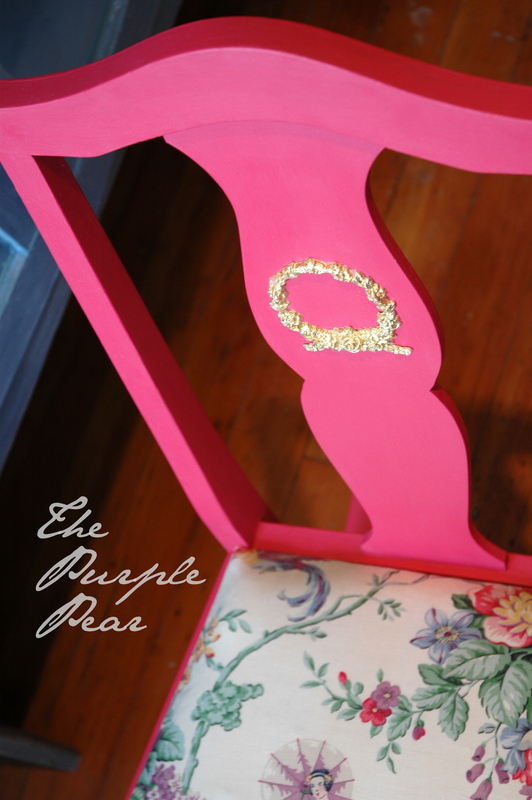 Now that my chair was the vibrant pink I had been dreaming of and even had a little gold embellishment, it was time to find the perfect fabric to finish it off! 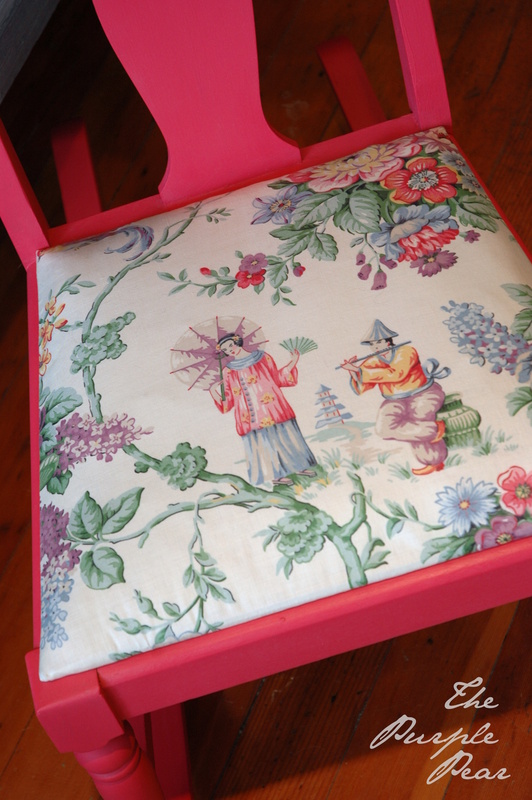 Chinoiserie, a fabric popular in the 18th century and made fashionable with Rococo décor, depicts whimsical scenery of an imaginary China. 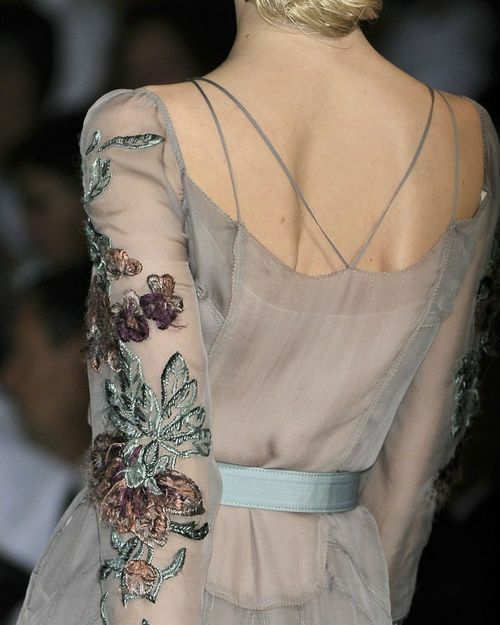 I have always loved this type of fabric and have acquired a bit of a collection. This piece that seemed so perfect for the painted rocker is most likely from the 1930’s. 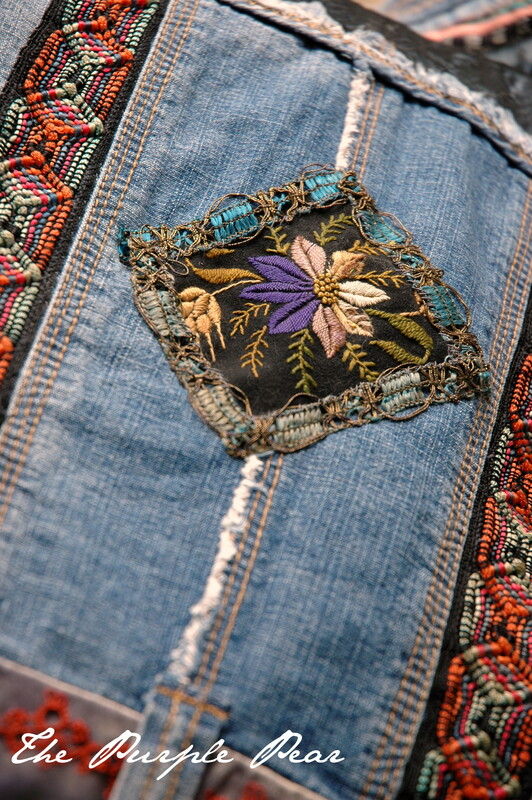 Using vintage textiles in creative projects is very rewarding. It’s a bit like bringing a piece of history back to life! I enjoy carrying a variety of antique textiles and trims in my shop to offer to my customers for their own creative endeavors! 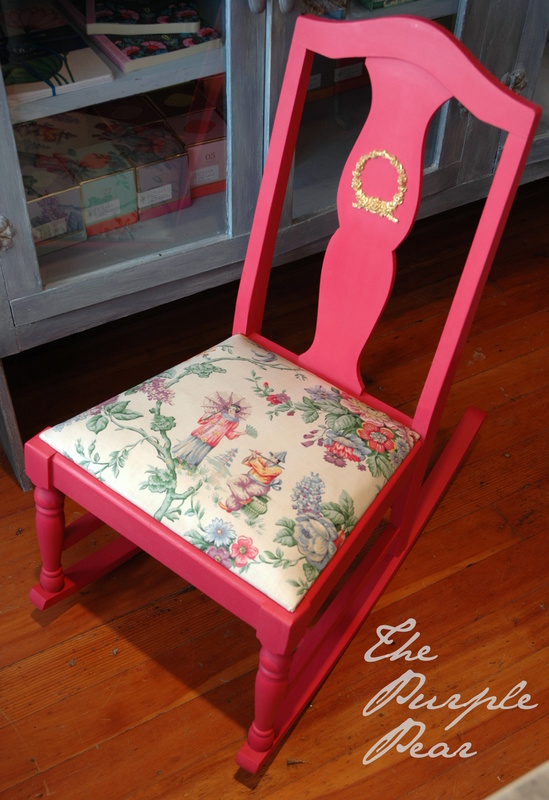 So there you have it, an inspired custom Chalk Paint® color and a wonderful vintage textile came together to make an ordinary little rocking chair something exquisite. I hope that you will take some time to be creative today, and that I may have inspired you to consider vintage textiles for your next upholstery or craft project! I sincerely thank you for your visit! My passion and enthusiasm for antique textiles and trims has always coincided with a desire to find creative ways to use and enjoy them. I will always collect these items and continue to offer a selection in my store. The ways in which they might be given a new life through artistic expression are endless. 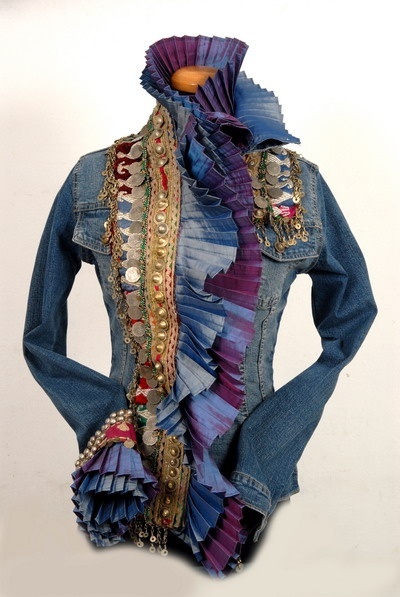 In this post I will explore some ideas and inspiration for incorporating antique textiles and trims into fashion…another topic that I am passionate about!